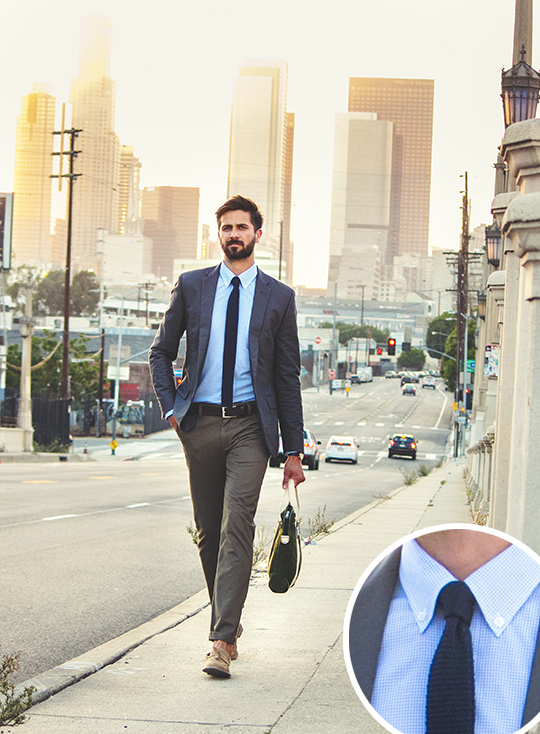 Learn the versatility of a strong foundation as we take one shirt and one pair of pants and create 4 looks perfect for wherever your day takes you. 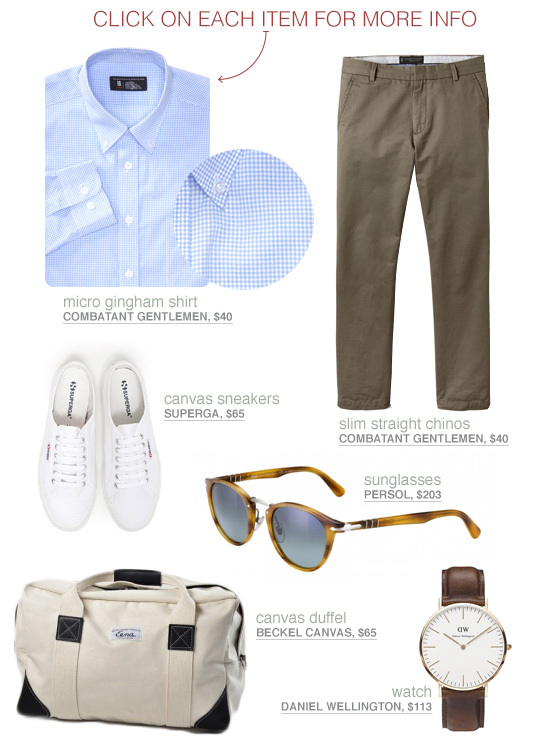 This piece made possible by Combatant Gentlemen, the easy way to stock up on essentials like chinos ($40), shirts ($40), and even suits ($140). 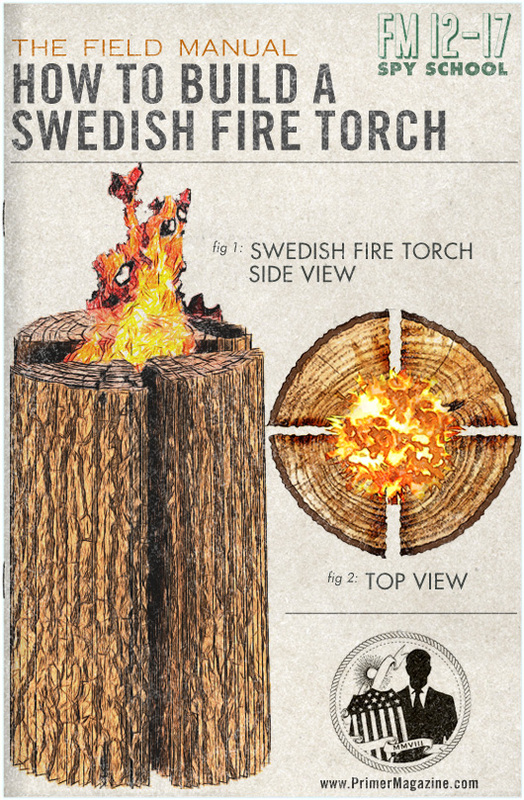 Click here to upgrade your style without draining your checking acount. “Dressing well” when you're new to style can feel overwhelming. Often times when starting out guys buy complete outfits for different occasions or level of dress. 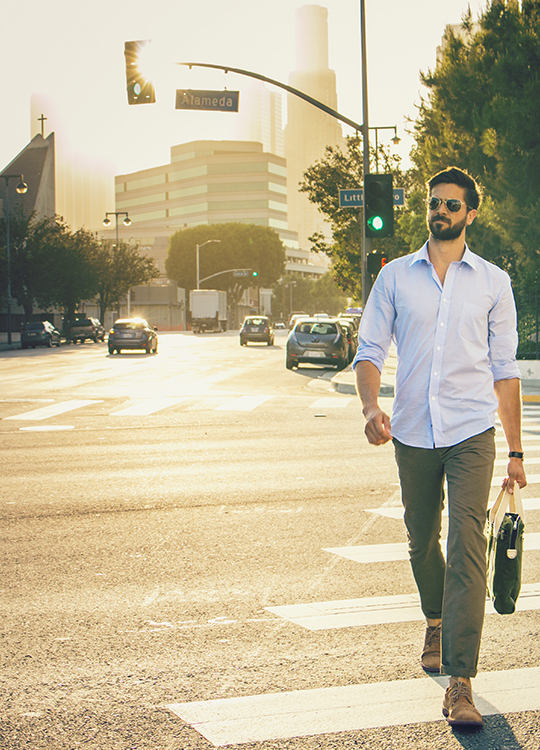 A dress-only shirt for suits, casual-only shirts for weekends. But the real trick to always dressing well is finding the right staples to build a versatile foundation from which many looks, from casual to dressy and everywhere in between, can be built. 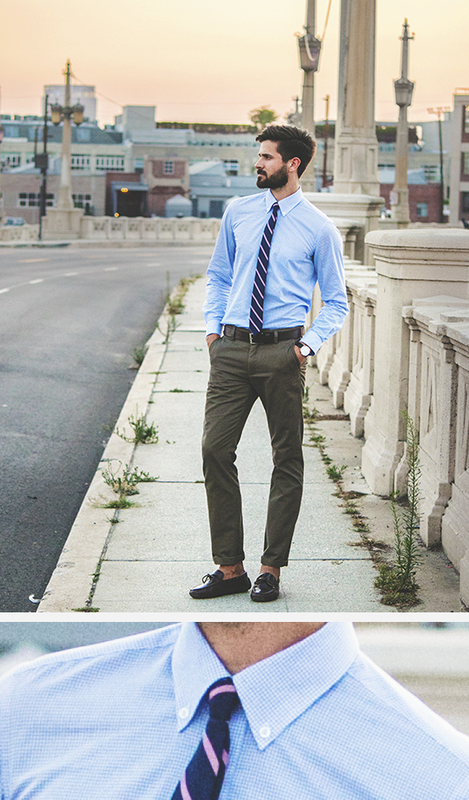 Here, fellow Primer reader Shane shows off how powerful a simple patterned shirt and chinos can really be. Just because it's the weekend doesn't mean you should dress lazy. 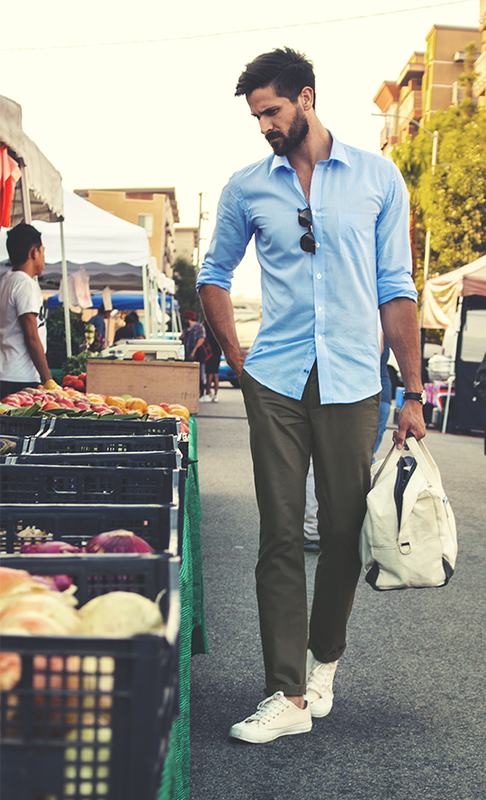 Be comfortable and well-dressed in this casual style perfect for a date at brunch or a farmer's market. With all of these Getups be mindful of the fitted profile of both the pants and the shirt. They are slim (but not tight) and that is paramount to their adaptability. You'll also notice where the pants fall, just below the ankle: As fits have become slimmer pant breaks across the board have become higher. This is also why the pants work with sneakers and dress shoes. Wider and longer pant legs become casual-only very quickly. 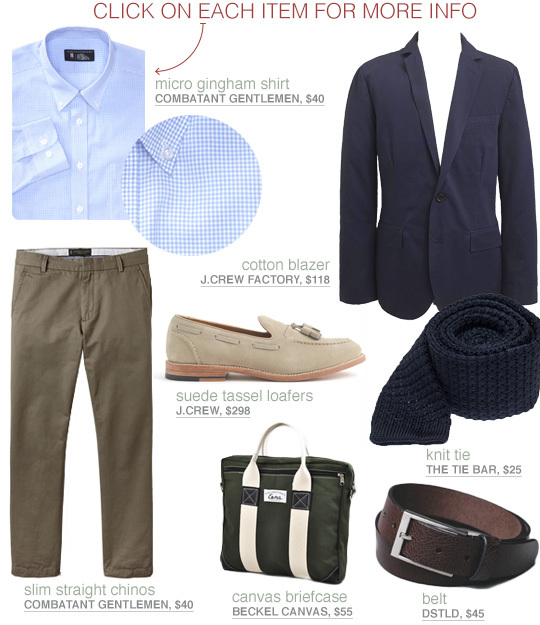 Flip to the other end of the spectrum, we simply add a knit tie, a navy blazer and suede loafers and we transform casual into a sharp look ready for a client meeting or a night out. 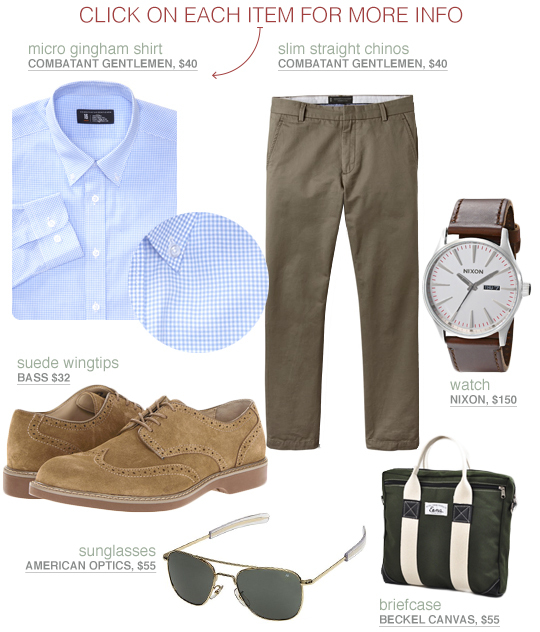 A shining example of how our choice in footwear determines the overall outfit, we take our casual Getup above and swap in suede wingtips. 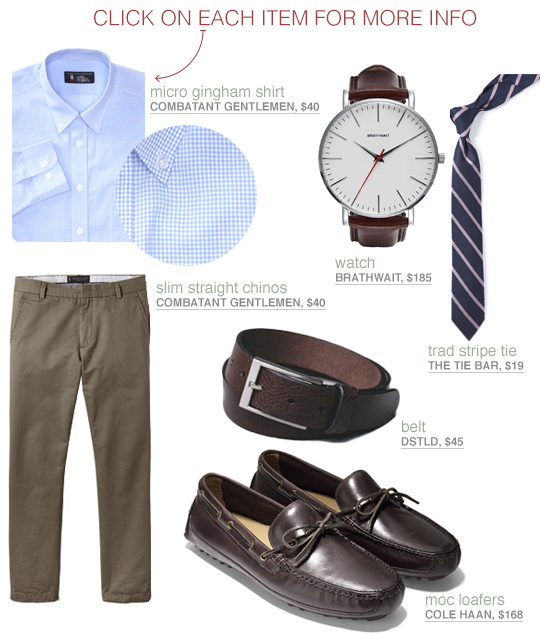 The look is now a step below business casual, ideal for looking intentional in a workplace with a loose dress code. The semi-professional workplace can be the hardest to dress for: A jacket is too much, but an untucked button-up isn't enough. Create a classic look by pairing the gingham shirt with a traditional striped tie and opt for a pair of dark brown moc loafers. The darker leather adds a dash of dressiness but the moc style grounds them in a more casual territory. As always, going sockless is inherently casual. 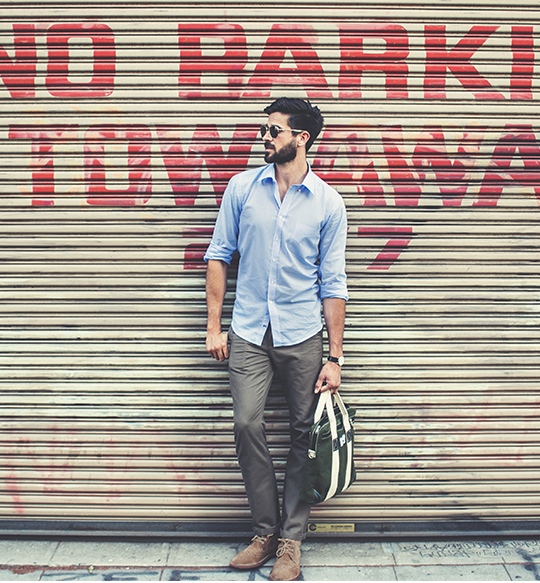 Whether you need affordable and quality basics like shirts, shorts, and casual pants or suits and outerwear, head on over to Combatant Gentlemen. You'll be doing both your personal style and wallet a favor. What color/shade are those chinos? Damn, Shane is one attractive dude. Loving this getup due to its simplicity, I know what I’ll be getting next payday! Keep up the great work Andrew, I’m a huge fan of yours. Shane, what happened to Denizen Society? Loved your ebooks, but haven’t seen many updates on the site. Thanks Eric! The site will be relatively static, I plan on releasing most new content via email for now. I should have some updates soon so stay tuned! Great post Shane, I’ll definitely be picking up a pair of those chinos. What color are those suede wingtips by Bass? Hey Michael! All the outfits are shoppable, so if you click through on them they’re the “taupe” color. Can pretty much guarantee CG will be sold out of this shirt for a while now. Thanks for the articles, keep em’ coming! I’m with you on that! Each look is perfect. Live Action Getups are the best. Thanks! Love simple combinations like this. It’s made even more versatile by the fact that you could switch out the pants for a dark pair of jeans, the shirt for a white shirt or switch both and all 4 looks would still work. I like seeing these live action getups so you get a sense of what the clothes look like on a real person. Great job! What is the fit like on the CG clothing as far as sizes? Do they run large, small, or true to size? Anyone here has any experience with Combatant Gentlemen shirts? I’m looking at their white dress shirts and wanted to know how thick/thin their materials are so that they aren’t “see-through”? name of this hairstyle?please?someone?or the name of this man?